Our crew has a few go-to spaces for walking the dog during the winter time (Cumberland Town Forest, Winslow Park in Freeport and Saco Heath Preserve come to mind), but we are itching to explore some new spaces with wide, well-marked trails. To help with our search, MP is turning to this handy list of land trusts by county. MP will admit it, for the longest time, she didn’t even know what a yurt was, much less believe she would ever stay in one. This his her year! MP and the family are spending a night at Maine Forest Yurts in Durham (pup included). We’re planning on bringing our snow shoes, exploring the property, playing cards and bringing something delicious to prepare for dinner. We can’t wait to unplug and enjoy time together. If you follow us on Facebook, you know we are super excited to try tubing at Thompson’s Point in Portland. 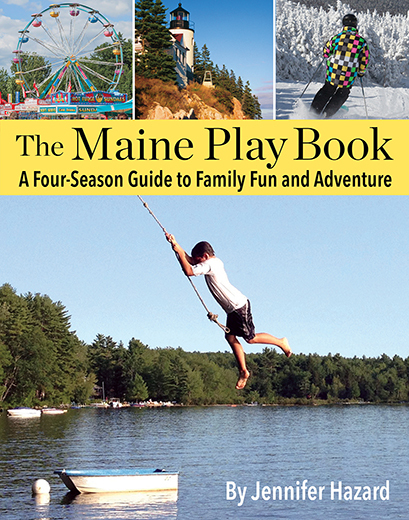 CP#1 also has a Winter Kids Passport, which offers some amazing deals for winter fun throughout Maine. With her passport, tubing is free at Seacoast Adventure Park in Windham with the purchase of an adult ticket. We can’t wait to visit after dark! If you’re not near to Portland or Windham, here’s a list of more places to snow tube in Maine. Visit Hidden Valley Nature Center. We’ve heard such good things about this beautiful nature and outdoor teaching center in Jefferson, which is part of the newly formed Midcoast Conservancy. Our family is planning a weekend road trip to explore the cross-country skiing trails. Hidden Valley also offers overnight stays at their cabin and yurts, and a variety of free programs geared towards families. A co-worker regularly goes to Circus on Point, a cabaret act at Circus Maine in Portland. MP is looking forward to seeing a show with the kids! The cabaret features local and international performers, including trapeze artists, acrobats, jugglers and more talent. Best yet, the shows are designed for kids of all ages (you’ll even find afternoon performances for the littles). The next shows are planned for February 17-19. Keep your eyes on the Circus Maine site for details. What about you? We’re curious to learn your plans for the winter months. Share your ideas here, and happy adventuring! PS: Our winter bucket list from last year, if you’d like to see.